One day I tried the famous Ultra Facial Cream by Kiehl’s and simply loved it. It’s a moisturizer and works wonders on your skin – and mine didn’t protest which was a good sign! This summer, when I was in Tenerife, I walked into a Kiehl’s shop to have a look. A very friendly shop keeper was immediately at my hand to help and to advice me. I told her that I’ve used the Ultra Facial Cream and would like to have something for the day that nourishes and perhaps something for the night. She asked me if and what I’m using for my eyes and I said: “Actually nothing..” WRONG answer! She blinked a couple of times and looked at me like I told her that I have a dead body in my backyard! “What? But you really should nourish the area around your eyes to prevent early wrinkles..” Haha well that’s where she convinced me to get myself an Avocado Creamy Eye Treatment. She asked me to come the next day so she could do a nice treatment on me with all kinds of products. For free. Of course I agreed and the next day I got an amazing treatment from cleansing to nourishing, boosting and creaming. Yeah I have this tendency to be an easy buyer so I bought the Midnight Recovery Concentrate and the Rosa Arctica Lightweight Cream. I’ve been using these products for a few weeks now and couldn’t be happier with the results: fresh and nourished skin. 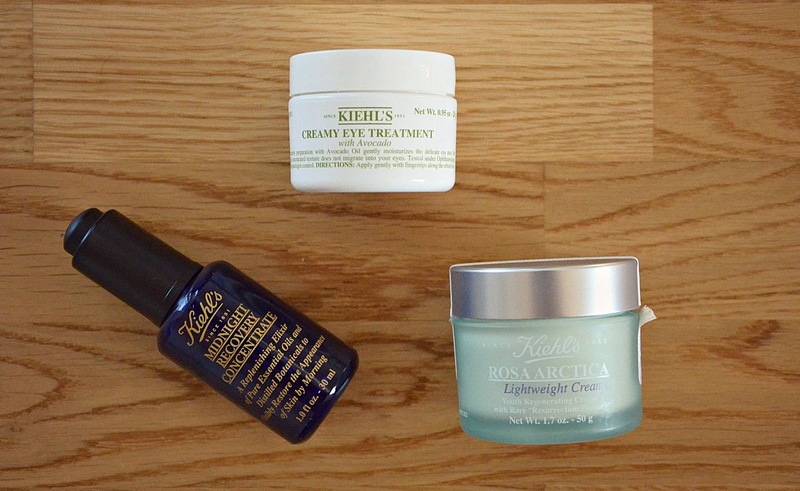 These three products are in my evening routine since the Midnight Recovery Concentrate is obviously a night serum. You put three drops of it on your palm (it’s a pipette), and tap it on your face. It has a very nice lavendel smell and it regenerates, repairs and replenishes skin over night. A very small amount is enough around the eyes. It gently moisturizes the delicate eye area. You know how you can tell that a cream has great quality? By the amount you have to use to apply over the whole face. With this one, I promise you only need the amount of a dried corn. Amazing and the skin feels so smooth! Anyway it’s hydrating the skin and fighting the signs of skin aging over time. They aren’t the cheapest but I think it’s worth the money since the products last for a long, long time and you really get quality for the price! Above I linked to the Swedish Online Shop but you can visit them at www.kiehls.com and chose the country you want!